In a previous post I wrote about the challenges Chilean winemakers face in changing consumer perception of their wines, a perception usually formed at the time the wines first entered the market. Naturally, the wines progress and develop as knowledge and experience increases but this is often a difficult message to communicate with any degree of success – first impressions last! The same could be said of South African wine. In speaking with members of the wine industry from South Africa, I recognise that same desire to update the popular perception of their wine, a message I support wholeheartedly. In recent months I have been fortunate enough to taste wine from South Africa on a number of occasions and what a pleasure it has been. Earlier this month I attended the HK Restaurant and Bar Trade Show where I came across Journey’s End Estate at the Links Concept stand. And a welcome catch up with a fellow wine geek in London saw a couple of absolutely delicious wines being shared – a white blend based on Chenin Blanc and a Syrah, both from Mullineux Wines in the Swartland region. A new initiative formed in January 2013, PIWOSA (Premium Independent Winemakers of South Africa), of which Journey’s End and Mullineux Wines are members, is a collective of winemakers seeking to promote premium wines from South Africa to an international market and to highlight the diversity of wine production in South Africa. If what I tasted from Journey’s End and Mullineux Wines is indicative of the wines from PIWOSA, this is an exciting time for the collective and I foresee a quickening in the change of perception of wine from South Africa. After much searching the Gabb family found such a site and in 1996 they purchased and replanted Journey’s End. There are two labels within their portfolio; four varietal wines – Journey’s End Chardonnay, Shiraz, Merlot and Cabernet Sauvignon – and two newly released super premium wines – the Cape Doctor (Cabernet Sauvignon) and Destination (Chardonnay). 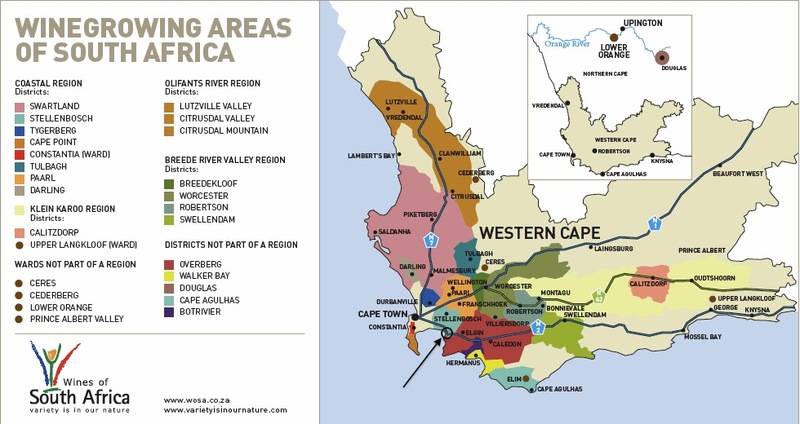 Journey’s End is in the Stellenbosch District and is located in the Helderberg Basin near Somerset West. With vines planted not far from the coast the famous Cape Doctor, a strong south-easterly spring-summer wind, presents a real risk and in 2010, 60% of the crop was lost due to the Doctor, which resulted in no red wine from that vintage. Looking back at my notes from the Restaurant and Bar Show seminar with Journey’s End Managing Director, Rollo Gabb, the words “elegant structure” appear more than a few times. What I particularly liked about these wines was the carefully crafted integration of oak, alcohol and acid together with just the right balance of fruit and spice. The 2007 Merlot is what drew me to Journey’s End. Although much maligned, Merlot can be an elegant wine, showing restrained fruit characteristics and moreish spiciness – the Journey’s End Merlot is a fine example of this. Black fruits such as plums and blackcurrants were well balanced with liquorice, aniseed and black pepper within a light but well structured body. And the eucalyptus notes were a welcome reminder of the trees in our back yard when we lived in Melbourne. Wine from South Africa is extremely well priced at the moment and the wines from Journey’s End and Mullineux are no exception. These wines would make an excellent addition to any gathering of both wine geeks and normal wine loving people alike! And, I see I am in expert company with my assessment if a recent article by Jancis Robinson and the 2013 International Wine and Spirit Competition results are anything to go by! 1. Johnson, H. & Robinson, J. (2007). The World Atlas of Wine. Great Britain: Mitchell Beazley, p. 366. A medium minus lemon colour. Aromas of citrus fruit, vanilla and dairy, cream cheese and butter. On the palate a rich and creamy texture with flavours of grapefruit, lemon, white peach and baked apple. Medium plus acidity with a medium finish of white flowers and limestone. A medium garnet colour. Aromas of red fruits, spice and raspberry leaf. On the palate a medium minus body with flavours of red plums, red and black cherries, graphite and black pepper. A medium garnet colour with an orange rim. Aromas of black plums, ground black pepper, peppercorns, leather, tobacco, cedar. On the palate flavours of blackcurrant, black plum, liquorice and aniseed. A medium minus body and medium plus acidity. I used to live in South Africa, but long before I was drinking wine! South African wines do not have a great reputation — I hope they are doing better. There is SO much competition!